Set in the 19th century. 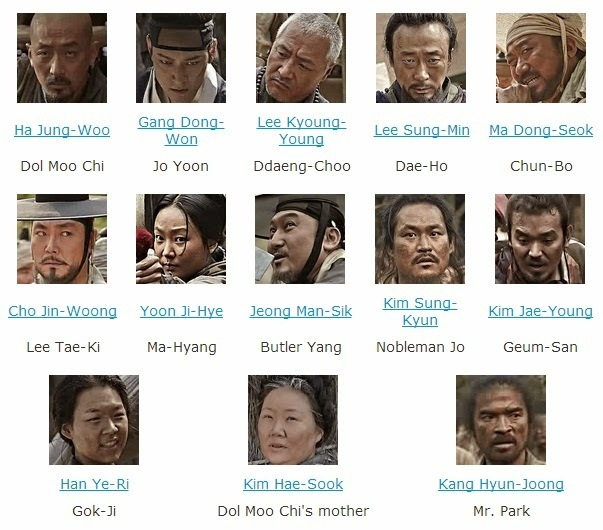 Jo Yoon (Gang Dong-Won) is the illegitimate son of a wealthy nobleman and a gisaeng. Because his father and his wife failed to have a son themselves, they bring Jo Yoon into their home at the age of 10. Later, his stepmother gives birth to their first legitimate son. Jo Yoon struggles for recognition from his father. A chance though arises for Jo Yoon to become a legitimate son. His younger stepbrother is killed by a group of thieves. Jo Yoon possesses elite sword skills and decides to plunder from the poor to amass a vast fortune. To become the only heir, Jo Yoon then decides to kill the pregnant wife of his late stepbrother. Meanwhile, Dol Moo-Chi (Ha Jung-Woo) works as a lowly butcher. He lives with his mother and younger sister. Dol Moo-Chi is then brought in front of Jo Yoon and is hired to kill Jo Yoon's pregnant sister-in-law. Dol Moo-Chi though is unable to carry out the execution. His failure causes tragedy to unfold upon his family and himself. As Dol Moo-Chi is about to be executed, a group of righteous thieves known as Kundo arrives.